St. Paul, Minn. – What do a University of Minnesota attorney, the founder and CEO of the country’s largest solar hot water provider, the director of the Minnesota Math and Science Academy, the Class of 1965’s 50th Reunion co-chair, a couple—a former USAID official and his spouse, an ESL teacher, a university’s Dean of Libraries Emeritus, and a bagpiper and building fundraiser, have in common? 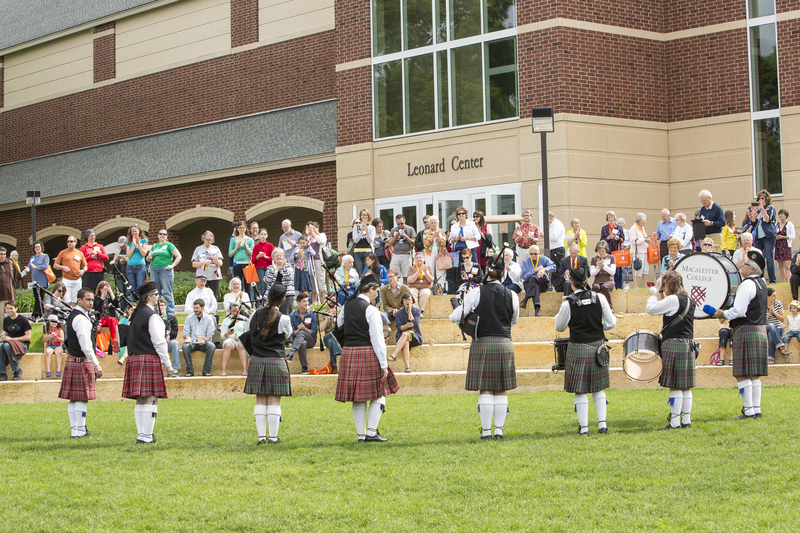 They are all Macalester alumni who will be honored at Reunion 2015, June 5-7. Susan and James Graham arrived at Macalester in the early 1960s eager to see the world. They married two days before graduation and then spent more than 20 years in Africa, exemplifying the spirit of global citizenship in their work. After earning her teacher’s certification, Susan joined Jim in Uganda, where he was already in graduate school thanks to a Macalester scholarship. A few years later, the U.S. Agency for International Development (USAID) offered him a job. The first assignment of Jim’s 35-year USAID career sent the family to the Congo. Over the next three decades, they lived in Mali, Sudan, Kenya, Rwanda, and Tunisia. Jim developed, implemented, and analyzed projects in collaboration with local officials. Susan taught English as a Second Language in Mali. In Rwanda, she worked on an AIDS research project, and in Kenya, she revitalized a blood bank’s system. Back in the U.S. in the 1990s, Jim managed USAID’s Central Africa Regional Program for the Environment, a 20-year project to preserve the Congo River basin’s ecosystem. Today, the Grahams volunteer near their Arlington, Va., home. Susan earned a master’s degree in linguistics and continues to teach ESL. They learned how to sail in Khartoum and now race on the Potomac River. They’re working on their Spanish proficiency and recently stayed with a host family in Guatemala—the latest chapter in their international travel, but far from a surprising development for the lifelong learners with a passion for global citizenship. Shelley Carthen Watson ’82, Shoreview, Minn., Catharine Lealtad Service to Society Award is given to an alumnus or alumna of color who has used his or her education to distinguish themselves in service to community. Shelley Carthen Watson had actually committed to attending another school when a well-timed packet of admissions materials from Macalester changed her mind—and, she now says, her life. University of Minnesota’s Office of the General Counsel, where she has worked ever since, providing counsel and training in labor relations and employment issues as well as defending the university in collective bargaining and other matters. At Macalester, she has served on the Board of Trustees, a presidential search committee, and the Alumni Board. She regularly serves as a host parent for the Alumni of Color Host Family Program. She’s happy to volunteer for Macalester, says Carthen Watson, because her experience here was “transforming,” turning her into a top-notch speaker, writer, thinker, and global citizen, and giving her lifelong friends. Her dream is that others will share that experience. “I want other students of color to have the gift of a Macalester education, to help produce the next generation” of outstanding African American alumni. This year marks the 100th anniversary that Dr. Catharine Deaver Lealtad, Macalester College’s first African American graduate, earned a double major degree in chemistry and history with highest honors in 1915. She was accepted into Cornell University’s medical school, but left shortly after her arrival due to the racial prejudice at Cornell. She went on to study medicine in Lyon, France, where she received her medical degree from the University of Paris in 1933, specializing in pediatrics. She created an endowed scholarship at Macalester in 1983 and is the only person to receive two honorary degrees from the college. Dr. Lealtad passed away in 1989. Zachary Axelrod ’06, Washington, D.C., Young Alumni Award recognizes alumni who have graduated in the past 15 years. This award pays tribute to those who are making an effective contribution to the community in which they live, or moving forward rapidly in their career, and living the kind of unselfish, caring life for which their Macalester education prepared them. Nine years after he graduated from Macalester, Zach Axelrod ’06 is the founder and CEO of the country’s largest solar hot water provider. His rapidly growing business, writes his nominator, is a “clean energy success story’’ – and his work is changing the field of renewable energy. David Bloom ’65, Seattle, Wash., Alumni Service Award recognizes an alumnus whose significant service and consistent loyalty to the college has set an outstanding example of volunteerism. The following will receive the Distinguished Citizen Award that recognizes alumni who have exercised leadership in civic, social, religious and professional activities. It is given because the Alumni Association, the Board of Trustees, and the faculty of Macalester believe that a college education should be the training and inspiration for unselfish and effective service to the community, the nation, and the world. Recipients demonstrate a practical acceptance of these obligations in their lives and work.